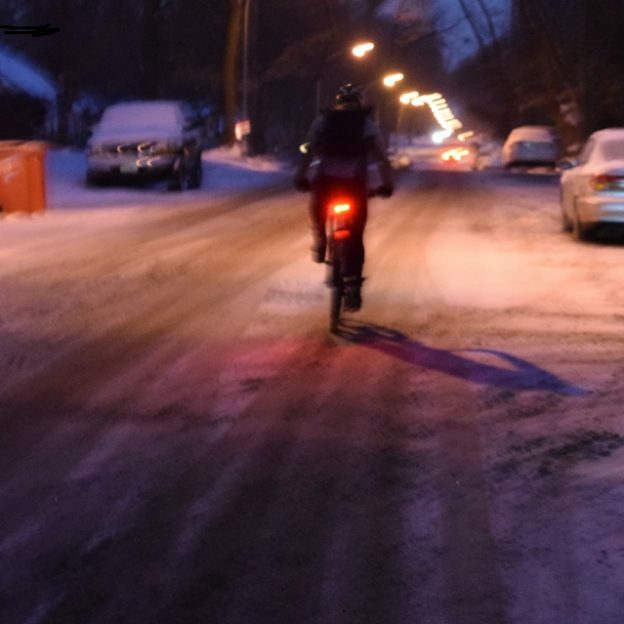 Winter’s icy grip can be an unforgivable time for bicyclists riding without studded tires. We enjoy the solitude of winter riding and the added fitness it offers, but as rain or snow turns to ice real dangers abound. To combat those slippery hazards the best tool is a studded tire. Basically, studded tires are a deep lugged tire that can accept steel studs. Some come with the studs installed while others are stud compatible. In my experience the best use for studs is on commuter tires. Commuting typically takes me through roads, sidewalks, bike paths, and bike lanes. These changing surfaces are never uniform in snow removal and always prone to ice. For that reason, I love to use studded tires on my commuter bike. They offer a level of consistency that I can’t get with normal, all-rubber tires. Additionally, the deep tread on these tires has the side benefit of puncture protection. Here in Minnesota we periodically run into conditions that require studs off road, but usually winter trails here are white and soft. By contrast, the winter trails in Philadelphia were covered in ice all winter thanks to the normal freeze/thaw cycles. If your trails are particularly icy, off-road studs are a great solution for you. 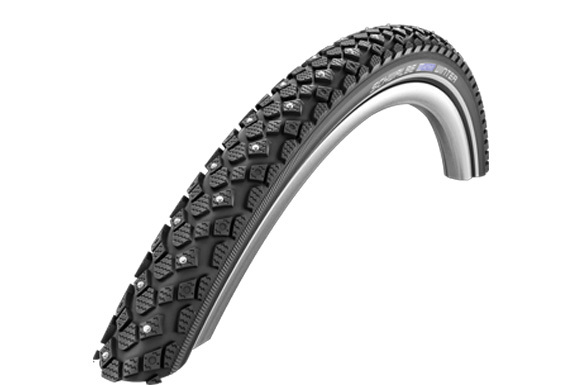 Studded tires are available for all types of mountain bikes with 26″, 27.5″, and 29″ versions from 2″-5″ in width. Also, there are mountain bike tires that are “stud compatible”. These “stud compatible” tires have pockets built into the tread designed to accept aftermarket studs. 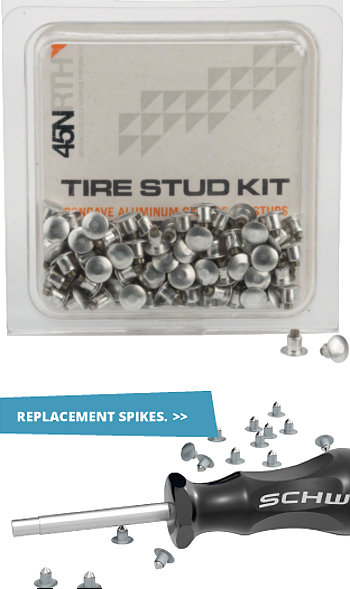 Beyond buying pre-studded tires, you can buy studs that install on existing tires. The easiest solution is to buy “stud compatible” tires, and install the studs when needed. The other option is to buy aftermarket studs like the Gripstud and thread them into a standard tire. Installing this type of stud is a relatively easy process. What is difficult is choosing the right tire. To install studs you need to be sure that the tire you plan to use has lugs large enough to support the stud. If you take the leap and go with studded tires, realize that they will be noisy on the road and heavy off road. While that doesn’t sound like a rousing endorsement, the pros do outweigh those few cons. The pros include added traction on icy road surfaces, as well as consistent traction off-road as trails go from snow to ice and back again. Winter is a great time to ride and studs help you enjoy it. This entry was posted in News and tagged 45nrth studded tire, 45nrth tires, bike commuting studded tires, bike commuting tires, cycling studded tires, fat biking, fatbike studded tires, ice biking, mtb snow, riding in the winter, Schwalbe stud, schwalbe studded tires, studded bike tires, tire spikes, why studded tires, winter ice rding, winter riding on January 4, 2018 by John Brown.